Background Topical glyceryl trinitrate (GTN) treatment has previously demonstrated short-term efficacy in the treatment of lateral epicondylosis. No long-term follow-up has been performed. Hypothesis Benefits from topical GTN persist 5 years after the cessation of therapy. Study design A prospective comparative study. Methods A follow-up study of 58 patients treated with 6 months of topical GTN or placebo, combined with a tendon rehabilitation programme, was performed 5 years after discontinuation of therapy. Assessment included patient-rated pain scores, clinically assessed lateral epicondylar and proximal common extensor tendon tenderness, hand-held dynamometer measurement of resisted third finger metacarpophalangeal extension with a fully extended elbow (Maudsley's test) and wrist extensor tendon mean peak force using a modified chair pick-up test (the Orthopaedic Research Institute—tennis elbow testing system). 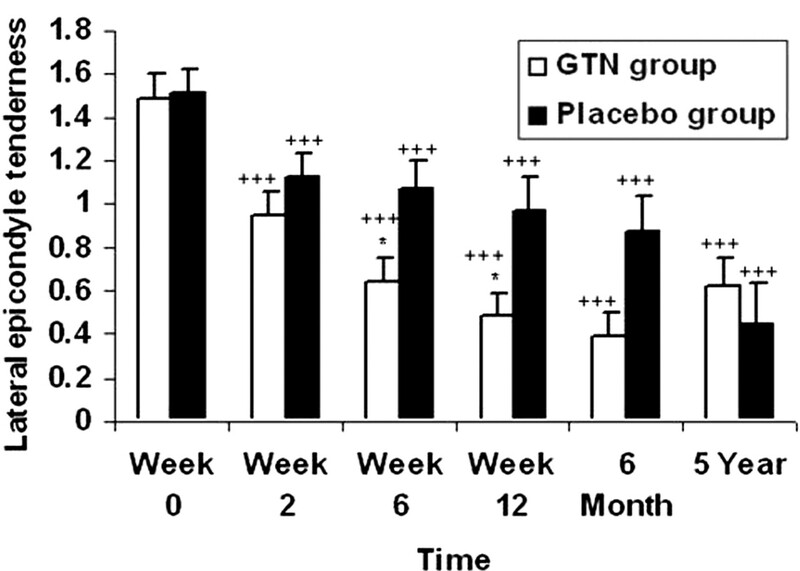 Results Patients in both the GTN group and those in the placebo group had significant improvements in symptoms, clinical signs and provocative functional tests compared with baseline week 0 measures. GTN did not offer any additional clinical benefit over a standard tendon rehabilitation programme at 5 years. Conclusion While GTN appears to offer short-term benefits up to 6 months in the treatment of lateral epicondylosis, at 5 years there does not appear to be significant clinical benefits when compared with patients undertaking a standard tendon rehabilitation programme alone. This is in contrast to findings of continued benefits at long-term follow-up described in the literature for patients with Achilles tendinopathy treated with GTN. Currently, best practice management involves rest, forearm bracing and stretching and strengthening exercise programmes,4 while other management options include analgesics and non-steroidal anti-inflammatory drugs (NSAID), corticosteroid injections, acupuncture, shock-wave therapy, laser therapy and surgery. The evidence for these treatments is often conflicting and as yet does not offer a clear picture on the most effective management of tennis elbow. There are several surgical options for treatment including excision of the degenerative tissue, release of the common extensor tendon, and debridement of the common tendinous origin with release of the annular ligament.17 While case series have reported good outcomes with respect to the alleviation of pain and few adverse effects, there is a lack of randomised controlled trials.18 Consequently, surgery is generally only recommended in treating chronic cases of lateral elbow pain when less invasive interventions have failed. In summary, no treatment is universally successful in managing this condition and although it is generally self-limiting, in some patients it can persist for years causing considerable morbidity through time lost at work and in recreational activities. Paoloni et al19 found that patients with lateral epicondylosis treated with topical GTN and tendon rehabilitation when compared with tendon rehabilitation alone had a significantly increased (p=0.005) chance of being asymptomatic with activities of daily living at 24 weeks and demonstrated significant improvements in symptoms, clinical signs, provocative functional tests and patient outcomes. In addition to the significant improvement in all measures at all testing periods that were observed in both the GTN and placebo groups, GTN patients demonstrated significantly reduced elbow pain with activity at 2 weeks, reduced lateral epicondylar and tendon tenderness at 6 and 12 weeks, and improved elbow peak force and total work at 24 weeks. Some patients experienced side effects of rash and headache, which resolved on the discontinuation of treatment. Despite short-term successes with topical GTN treatment, a literature search of MEDLINE and PUBMED found limited clinical research on topical GTN treatment of tendinopathy, and no long-term follow-up studies on its use in the treatment of chronic lateral epicondylosis were identified. The aim of this study was to assess whether the improved patient outcomes noted at 6 months persisted 5 years later, and whether differences between groups persisted with time. This study was a follow-up of the randomised, double-blind, placebo controlled clinical trial initially investigating the use of topical GTN therapy in treating chronic lateral epicondylosis at the elbow.19 Previously, 86 patients with lateral epicondylosis were randomly assigned into two equal groups; both were instructed to perform a standard tendon rehabilitation programme. One group received an active GTN transdermal patch, while the other received a placebo patch. A prospective comparative study of adult patients involved in the 6-month clinical trial was conducted 5 years after the cessation of therapy; this study was approved by the South Eastern Sydney Area Health Service Ethics Committee. All patients involved in the original clinical trial were contacted by telephone and asked if they wished to participate in a follow-up study. Patients who consented were assessed at one clinical visit. It was recognised that the original clinical trial patients have not had controlled treatment in the interim and may have utilised other treatments for their elbow, possibly confounding the results; however, it was asserted that this follow-up would still provide useful information on long-term patient outcomes, and consequently all patients consenting to the follow-up were assessed. The symptoms and signs used as outcome measures for assessing response to treatment in this clinical trial were patient-rated elbow pain at rest (0–4), patient-rated elbow pain with activity (0–4), patient-rated elbow pain at night (0–4), local epicondylar and tendon tenderness (0–3), dynamometer measured strength with Maudsley's test (measured in Newtons), and wrist extensor mean peak force. Outcome measures were analysed with Sigmastat 11.0 statistical software and Microsoft Excel using t tests to compare differences between groups. The level of significance was defined at p=0.05. When it was determined data were normally distributed, paired and unpaired Student's t tests were used to compare differences within and between groups, respectively. For data that were not distributed normally, Wilcoxon signed-rank tests were used to compare differences within groups, and Mann–Whitney rank sum tests were used to compare differences between groups. A Fisher's exact test analysis of patient-reported symptom outcomes and clinical tenderness was also performed. Originally, 86 patients were recruited to participate in the randomised controlled trial by Paoloni et al,19 of whom 74 completed the 6-month trial. Of the 74 patients who completed the trial, we were able to contact 55 patients, with 52 (70%) included in the 5-year follow-up results. In addition, six patients who had dropped out of the initial trial agreed to participate in the follow-up. Five had dropped out after week 2 (four from the GTN group and one from the placebo group) and one had dropped out after week 12 (from the placebo group). Their results were included and analysed on an ‘intent to treat’ basis (figure 1). There were no significant differences in the patient drop-out rate between the GTN and placebo groups. 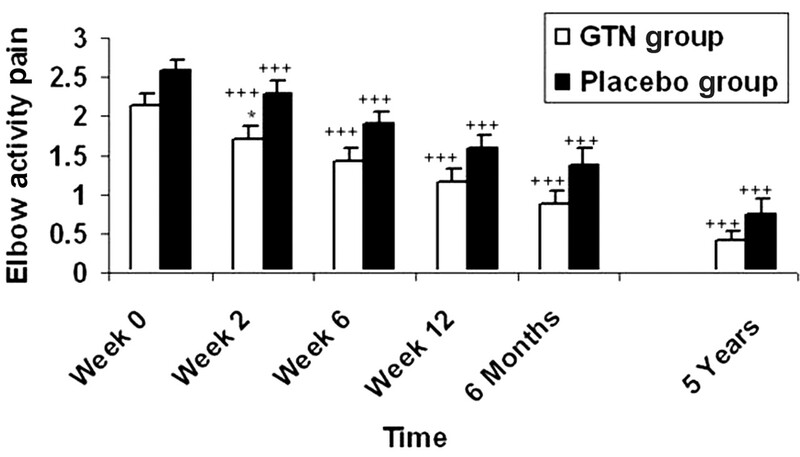 Of the 22 patients who completed the 6-month trial but did not participate in the follow-up, 12 were from the GTN group and 10 were from the placebo group. Only three of these 22 were able to be contacted and declined to participate with no reason given, while the remainder were unable to be reached. Attempts were made to contact these patients through home, work and referring doctor contact numbers from patient files, as well as a phone book and internet search. Twenty-one of the 5-year follow-up patients (eight from the GTN group, 13 from the placebo group) were unable to attend the clinic; however, they agreed to a phone interview in which verbal descriptor scales were given for them to rate the severity of their elbow pain with activity at rest and at night. Of those unable to attend, the reasons given were: work or time restrictions (12); relocation to another area (seven) and poor health (two). Therefore, data on 58 patients were collected; however, as mentioned above 21 patients could not attend for clinical examination and so were not assessed for lateral epicondyle tenderness, dynamometer measured strength of third metacarpophalangeal joint extension or wrist extension strength. Of the 58 patients in the comparative study there were 33 men and 25 women, with a median age of 58 years (range 40–78). Bilateral disease was present in four patients (three from the GTN group, one from the placebo group). There were 27 patients (31 tendons) in the GTN group and 31 patients (32 tendons) in the placebo group. Patients in the trial had previously demonstrated significant improvements compared with baseline week 0 measures in patient-rated pain scores, epicondyle tenderness and objectively assessed strength tests in both the GTN and placebo groups at 6 months. 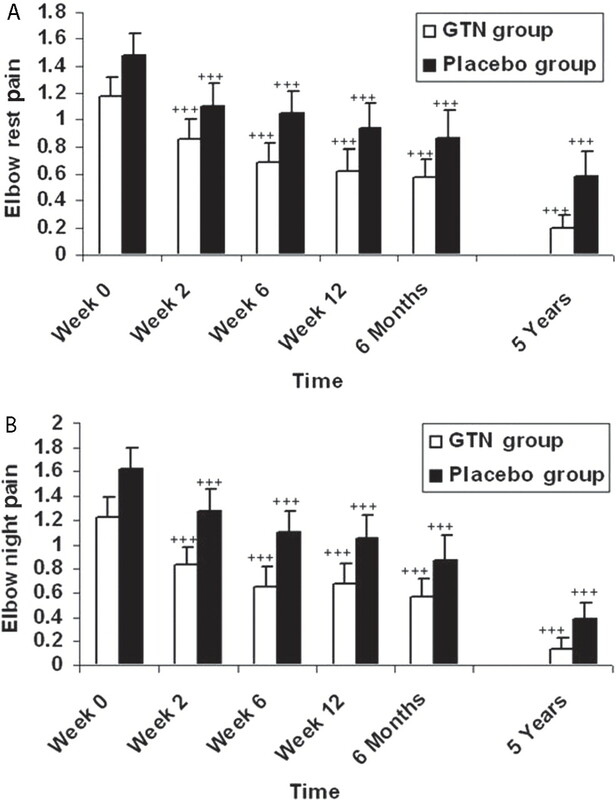 In addition, compared with placebo, patients in the GTN group had significantly reduced elbow pain with activity at 2 weeks, reduced epicondylar tenderness at 6 and 12 weeks, and an increase in wrist extensor mean peak force at 6 months as well as significantly reduced symptom prevalence at 6 months. At the 5-year follow-up, further improvements in patient-rated pain scores for both groups were noted, while objectively assessed strength scores remained similar to those recorded at 6 months. There were no longer any significant differences demonstrated between the GTN and placebo groups for any of the outcomes measured. Analysis of patient-rated pain scores found that significant improvements still existed in both the GTN and placebo groups (p<0.001) for pain at rest with activity and at night at 5 years compared with week 0. However, a comparison of patient-rated pain scores found no significant differences in pain severity between the GTN and placebo groups for activity pain (p=0.24), rest pain (p=0.16), or night pain (p=0.16) at 5 years. Similarly, there was no significant difference in the prevalence of pain with activity (p=0.43) at rest (p=0.24) or at night (p=0.26) between the groups at 5 years. There were also no significant differences in the prevalence of lateral epicondylar tenderness (p=0.52) or in tenderness severity (p=0.16) (figures 2–4). Effect of topical glyceryl trinitrate (GTN) on patient-rated pain with activity. Mean (SEM), n=27 for GTN group, n=31 for placebo group. +++p<0.001, compared with week 0 using Wilcoxon signed-rank test; *p<0.05, between GTN and placebo groups using Mann–Whitney rank sum test. Effect of topical glyceryl trinitrate (GTN) on patient-rated pain (A) at rest and (B) at night. Mean (SEM), n=27 for GTN group, n=31 for placebo group. +++p<0.001, compared with week 0 using Wilcoxon signed-rank test; *p<0.05, between GTN and placebo groups using Mann–Whitney rank sum test. Effect of topical glyceryl trinitrate (GTN) versus placebo on lateral epicondyle tenderness. Mean (SEM) +++p<0.001, compared with week 0 using Wilcoxon signed-rank test; *p<0.05, between GTN and placebo groups using Mann–Whitney rank sum test. Both the GTN group and the placebo group had significant (p=0.01) improvements in wrist extensor mean peak force at 5 years compared with week 0. However, the differences between the GTN group and the placebo group at 5 years were not significant (14.0 (1.55), vs 11.8 (1.02) mean (SEM), p=0.3). 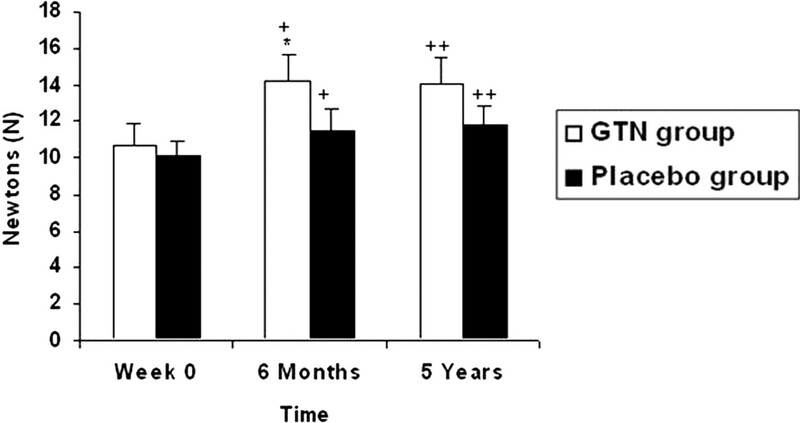 In addition, no significant differences were found for the GTN group or placebo group when comparing 6-month and 5-year scores (GTN group p=0.52, placebo group p=0.8) (figure 5). Comparison of the glyceryl trinitrate (GTN) group compared with the placebo group on clinically assessed wrist extensor mean peak force. Mean (SEM), n=19 for GTN group, n=18 for placebo group. +p<0.05, ++p=0.01, compared with week 0 using Wilcoxon signed-rank test; *p<0.05 comparing GTN and placebo groups using Mann–Whitney rank sum test. An analysis of Maudsley's test scores determined the data were normally distributed with equal variance. Scores in both groups were slightly reduced from those recorded at 6 months; however, paired t tests confirmed that significant improvements in Maudsley's test scores compared with pre-trial scores noted at 6 months were still present for both the GTN group (p<0.001) and the placebo group (p<0.02). There was no significant difference between the groups after 5 years (24.6 vs 24.1, p=0.84) (figure 6). Comparison of Maudsley's test scores (measured in Newtons) between glyceryl trinitrate (GTN) and placebo groups. ++p<0.02; +++p<0.001 compared with week 0 using paired Student's t test. This study showed that 5 years after the cessation of therapy for lateral epicondylosis, both the patients treated with topical GTN and those undertaking tendon rehabilitation alone had significant improvements in symptoms, clinical signs and provocative functional tests compared with baseline measures. The improvements in symptoms and signs noted at 6 months had been maintained at 5 years, and in some cases enhanced. There was no residual benefit of GTN compared with placebo at 5 years. 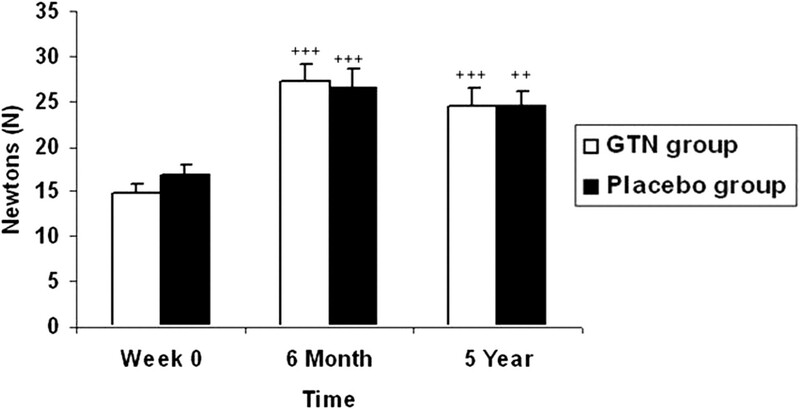 It is known that the healing tendon relies on the fibroblastic production of collagen for repair, possible mechanisms of longer- term benefits from GTN include stimulation of collagen production by fibroblasts and modulation of tendon apoptosis or programmed cell death.23 24 26 The mechanism of action was not assessed in this study, but results suggest that any increased tendon healing does not improve patient outcomes at a long-term follow-up of 5 years. There are several limitations to this study. The lack of controlled treatment between the 6-month and 5-year follow-up could be a confounding factor, with other treatments potentially used in the interim influencing results. As the average episode of extensor tendinosis only lasts between 6 months and 2 years4 a further limitation could be that benefits to tendon healing from GTN may not be clinically relevant 5 years after the cessation of therapy. Before study commencement a power analysis determined that to have a 90% probability of finding a 40% difference between groups, it was necessary to recruit 80 patients for the trial. Although this target was originally achieved, only 58 patients recruited to the trial completed the 5-year follow-up. Consequently, it is possible that differences between groups at 5 years may not be evident as a result of type II error. Previously there has been no long-term follow-up of patients with lateral epicondylosis treated with GTN, thus this study is the first to assess whether benefits noted in short-term outcomes persist with time. This follow-up study is the first to show that significant improvements in patient outcomes do not continue at long-term follow-up (5 years) for patients treated with topical GTN. This is in contrast to the finding of continued benefits at 3 years for patients with Achilles tendinopathy treated with topical GTN. Furthermore, this is the first study to evaluate the long-term (5-year) outcomes of a stretching and strengthening regime for lateral epicondylosis. This study indicated that the significant improvements in pain scores and functional tests noted after 6 months of a tendon stretching and strengthening programme were maintained or improved at 5 years. In conclusion, GTN appears to offer short-term benefits up to 6 months in the treatment of chronic lateral epicondylosis; however, at 5 years there does not appear to be significant differences in patient outcomes when compared with patients undertaking rehabilitation alone.
. Prevalence, incidence, and remission rates of some common rheumatic diseases or syndromes. Scand J Rheumatol 1974;3:145–53.
. Prevalence and determinants of lateral and medial epicondylitis: a population study. Am J Epidemiol 2006;164:1065–74.
. Corticosteroid injections for lateral epicondylitis: a systematic overview. Br J Gen Pract 1996;46:209–16.
. Clinical sports medicine, 2nd edn. Roseville, NSW: McGraw-Hill, 2002.
. Physical and psychosocial risk factors for lateral epicondylitis: a population based case-referent study. Occup Environ Med 2003;60:322–9.
. Non-steroidal anti-inflammatory drugs (NSAIDs) for treating lateral elbow pain in adults. Cochrane Database Syst Rev 2002;CD003686.
. Lateral epicondylitis: correlation of MR imaging, surgical, and histopathologic findings. Radiology 1995;196:43–6.
. Current concepts in the management of tendon disorders. Rheumatology (Oxford) 2006;45:508–21.
. The use of therapeutic medications for soft-tissue injuries in sports medicine. Med J Aust 2005;183:384–8.
. Corticosteroid injections for lateral epicondylitis: a systematic review. Pain 2002;96:23–40.
. Effectiveness of physiotherapy for lateral epicondylitis: a systematic review. Ann Med 2003;35:51–62.
. Orthotic devices for the treatment of tennis elbow. Cochrane Database Syst Rev 2002;CD001821.
. A systematic review and meta-analysis of clinical trials on physical interventions for lateral epicondylalgia. Br J Sports Med 2005;39:411–22; discussion 411–22.
. Systematic review of the efficacy and safety of shock wave therapy for lateral elbow pain. J Rheumatol 2006;33:1351–63.
. Acupuncture for lateral elbow pain. Cochrane Database Syst Rev 2002;CD003527..
. Rehabilitation for patients with lateral epicondylitis: a systematic review. J Hand Ther 2004;17:243–66.
. Sonographic examination of lateral epicondylitis. AJR Am J Roentgenol 2001;176:777–82.
. Surgery for lateral elbow pain. Cochrane Database Syst Rev 2002;(1):CD003525.
. Successful treatment of shoulder pain syndrome due to supraspinatus tendinitis with transdermal nitroglycerin. A double blind study. Pain 1996;66:63–7.
. Topical gylceryl trinitrate treatment of chronic non-insertional Achilles tendinopathy: a randomized, double-blind, placebo controlled clinical trial. J Bone Joint Surg 2004;86-A:915–20.
. Nitric oxide, an autocrine regulator of wound fibroblast synthetic function. J Immunol 1997;158:2375–81.
. Enhancement of fibroblast collagen synthesis by nitric oxide. Nitric Oxide 2000;4:572–82.
. Nitric oxide enhances collagen synthesis in cultured human tendon cells. J Orthop Res 2006;24:159–72.
. A self-administered questionnaire for assessment of symptoms and function of the shoulder. J Bone Joint Surg Am 1997;79:738–48.
. The Orthopaedic Research Institute Tennis Elbow Testing System: a modified chair pick-up test-interrater and intrarater reliability testing and validity for monitoring lateral epicondylosis. J Shoulder Elbow Surg 2004;13:72–7.
. Three-year followup study of topical glyceryl trinitrate treatment of chronic noninsertional achilles tendinopathy. Foot Ankle Int 2007;28:1064–8. Ethics approval This study was approved by the South Eastern Sydney Area Health Service Ethics Committee.